There is much more to invisibility than meets the eye. From Harry Potter’s magic cloak to the F-117 stealth aircraft, the public has had a long-standing fascination with the concept of invisibility. Media Studies department professor Ravindra Mohabeer explores a variety of concepts related to invisibility in a presentation at Vancouver Island University (VIU) on Friday Nov. 26, 10 to 11:30 am in the Nanaimo campus Library, room 507. 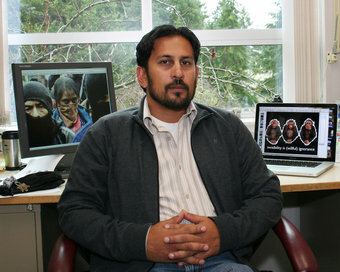 VIU Media Studies professor Ravindra Mohabeer uses a variety of images including masked rebels and a monkey who “sees no evil” in his exploration of the nature of invisibility. His presentation, “On Children, Technology, Spiders & More: The Multidimensionality of Invisibility,” is part of VIU’s Arts and Humanities Colloquium series. It is free and open to the public. “Invisibility works as a process. It’s really a question of context,” he suggests. Mohabeer gives the example of a homeowner who is more interested in the colour of a wall than the studs that are hidden from sight. That all changes when termites get involved, he says. Mohabeer will use images from news media and advertising as well scenes from nature and urban life to raise questions about what people tend to see and what they overlook. In his presentation, Mohabeer will point out the invisible world of children as parallel to but separate from the world of adults. He will note examples from the natural world, such as spiders who survive thanks to webs that blend in with the environment. “It’s a strategic practice,” he says. Mohabeer displays the image of a Mexican Zapatista rebel and points out that his mask provides an element of invisibility. “In that degree of hiding, there’s an exercise of power,” says Mohabeer. He will draw on his experiences as a student, as an immigrant to Canada, and as someone who traded life in Toronto for the opportunity to teach at Vancouver Island University for this exploration of the invisible. In addition to teaching in the Media Studies Department, Mohabeer is co-director of VIU’s Media Research Lab. For more information on this and other events in the Arts and Humanities Colloquium series, contact: Katharina Rout at katharina.rout@viu.ca or Helen Brown at Helen.brown@viu.ca.